Michonne, who’s leading zombies along on chains. And, you get Everybody Makes Fun of Redneck Until the Zombie Apocalypse. Plus, This Isn’t a Democracy Anymore It’s a Ricktatorship. 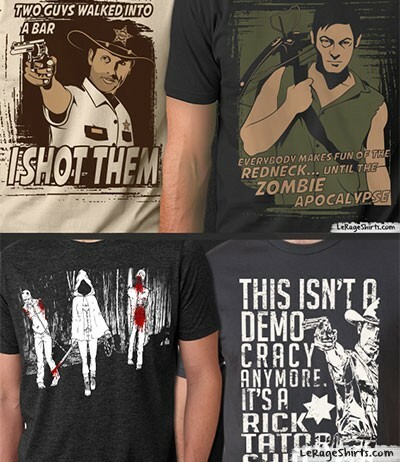 For reals…this is a great deal on great looking Walking Dead designs. What more could you want if you’re a fan? It’s Rick Grimes, Daryl Dixon and Michonne. They should take care of you. Very surprised to hear of your experience.